If you have been arrested and charged with a crime, you need to contact a criminal defense lawyer as soon as possible. Hiring a criminal defense attorney means you’ll have someone on your side that understands the law, and can fight on your behalf. Hiring a great criminal lawyer means that your lawyer can explain your rights and help you understand how the law applies to your case. Facing criminal charges in California is stressful. Having the right criminal defense lawyer to defend your interests can make the difference between a conviction and a criminal record, and a verdict in your favor. Choosing a great criminal defense lawyer can seem overwhelming. There are a lot of things to consider, and a lot of lawyers to choose from. So, how do you go about choosing the right criminal defense attorney for your case? 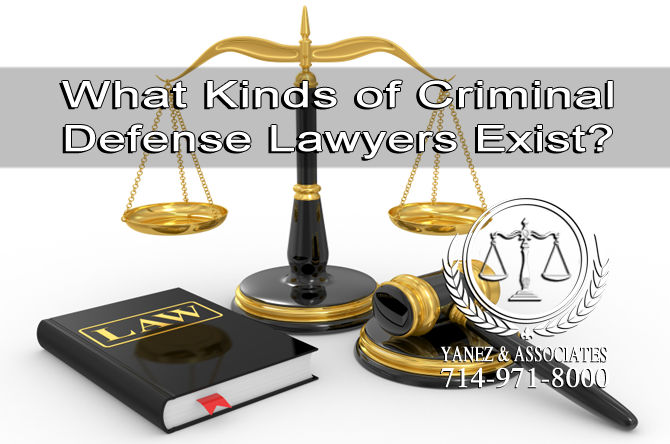 What Kinds of Criminal Defense Lawyers Exist? What Kind of a Criminal Defense Attorney will I need? When a person is charged with a criminal offense, a criminal defense lawyer is the one who represents the charged person throughout the legal process. A criminal lawyer understands criminal law, and can provide information and guidance throughout a criminal case. It is important to meet with a criminal defense attorney before hiring one. Depending on the crime you have been charged with, you may need a different kind of criminal defense lawyer. State laws and federal laws are different, and depending on which one applies to your case, you will be charged by a different government agency. Certain kinds of criminal defense lawyers focus their practice on specific types of criminal cases. In order to be an expert or to specialize, a lawyer needs to have received specific training. However, a lawyer who has experience practicing the kind of law that applies to your case will be the most useful attorney you can hire. For example, if you are charged with shoplifting, a lawyer with experience defending accused shoplifters will be more useful to you than one who has experience defending murderers. Whether you have worked with a lawyer in the past, or this is your first time hiring one, it’s best to conduct a little bit of research first. While the Internet is a great resource, it’s not the only one available to you. Consider asking friends and family members if they have worked with attorneys in the past, or if they know any lawyers in your area. Even if you know someone who has worked with a family law attorney, if they had a good experience with their lawyer, you may want to ask that attorney for a reference to a criminal defense lawyer. The Internet is one of the best ways to find a lot of local lawyers. Lawyers who are in your area are likely to have worked with the prosecution you may be facing, which could benefit you in your case. The Internet is also full of reviews. It can be helpful to read reviews from previous clients before choosing a new attorney, especially if you are looking for certain qualities or you want to know how the attorney runs his or her practice. Professional organizations in your area may have directories of lawyers. 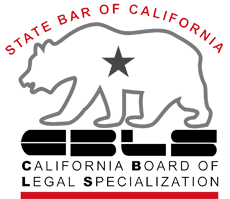 Contact a professional organization or the State Bar Association website if you need help finding a lawyer. What qualities should I look for when considering my criminal defense attorney in Santa Ana, CA? In addition to your lawyer’s legal experience, there are other qualities and characteristics that you might want to look for. You will likely be spending a lot of time with your lawyer, so you may want to consider these qualities. Some lawyers work in small practices while others run large firms. It is important to decide how much you value working with the attorney at all times versus working with a legal assistant or associate attorney. Every attorney excels in different areas. Some are better at communicating with their clients, some are better at negotiating, and some have better people skills than others. Attorneys also charge different fees, accept varying methods of payment and may or may not be willing to work with you. There are lawyers who are in it for the money or the publicity, and there are lawyers whose goal is to help those who need it most. Consider what you need regarding personality, your budget, professionalism, track record, etc. It always helps to have references for potential attorneys, because a reference can speak to how the attorney acts during a case. Remember that the best lawyer for you is not always the best lawyer for another person. There is no overall “best attorney”. Every lawyer is different, just like every legal case is different. • You and your lawyer will have a general conversation that gives both of you an opportunity to decide whether you want to work together or not. 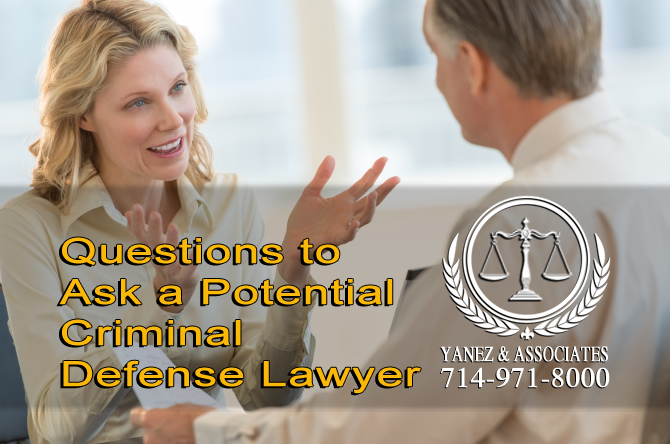 What Questions should I Ask a Potential Criminal Defense Lawyer in Anaheim? When you are meeting a potential criminal defense attorney, try to prepare before the meeting. 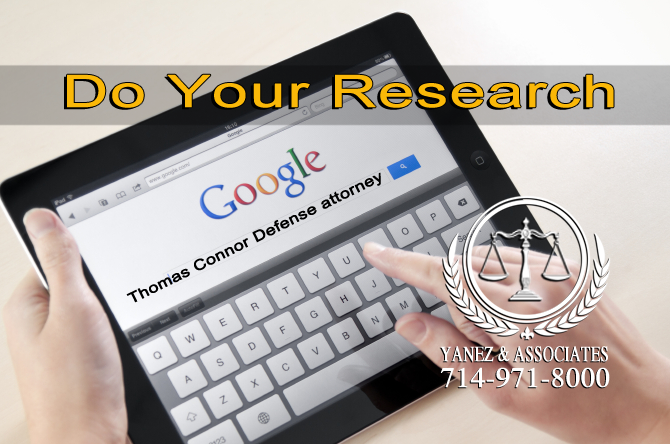 You may have already done some research into the law, your case, or different attorneys in your area. The following questions can be helpful in finding the right criminal defense lawyer for you. What kinds of cases have you successfully handled in the past? What kinds of cases do you handle most often? Tell me about a case that you handled in the past that did not go well? How would you handle that case differently if you had it today? What is your educational background? For how long have you been practicing law in California? For how long have you been practicing criminal law in California? What are your fees? What kinds of payment options do you offer? Have you ever handled a case like mine before? How did it go? What is the general process for handling this kind of a case? What actions would you suggest if I do decide to hire you and move forward? Would I be working directly with my lawyer or will legal assistants handle my case? 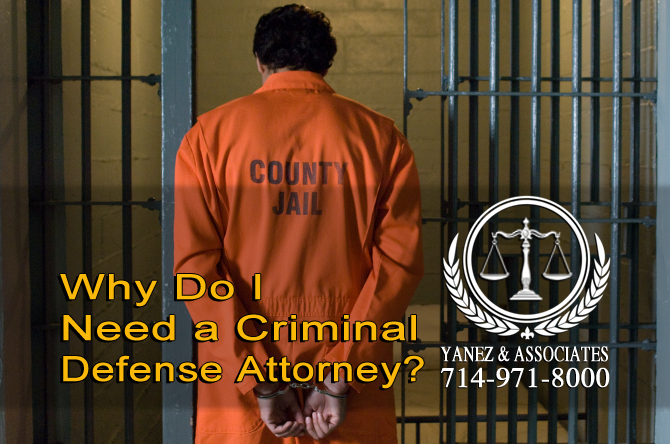 What can a Criminal Defense Attorney Orange County, CA help me with? It is always a good idea to work with a lawyer when you are facing criminal charges or involved in a legal case of any kind. A lawyer is a source of legal information, legal advice, and guidance that can help you in your case in order to get the best result possible. A great criminal defense attorney in California can help you in several ways. The sooner you involve a lawyer in your case, the better he or she can help you. • A lawyer may be able to reduce your charge from the initial charge to a lesser offense. This means a felony may be reduced to a misdemeanor, or multiple charges could be condensed into one. • A lawyer may be able to reduce your sentence to a less severe one. In some cases, a lawyer can fight for probation instead of jail time, or community service in lieu of a harsher option. 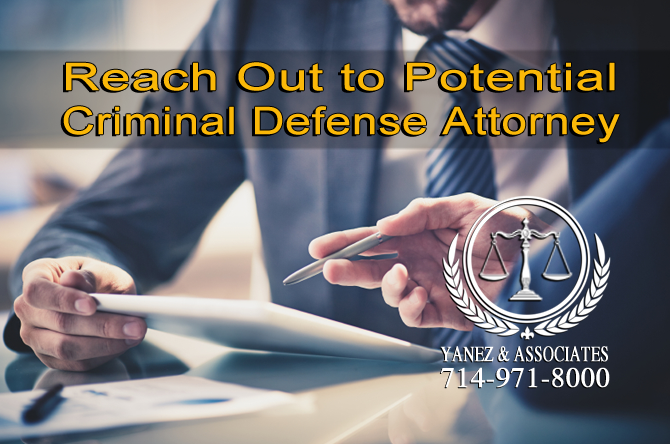 • Your lawyer is also there to help you prepare to appear in court, if necessary, to handle paperwork, and to build a solid defense for your case. Choosing not to hire a defense attorney means that you are leaving yourself vulnerable to harsh criminal conviction and a serious sentence. If you are convicted, your punishment will likely go beyond the sentence. A criminal record can be a difficult thing to shake, especially when it comes to finding a job following your sentence. Sentences can vary from fines or community service to probation or jail time to prison. All of these sentences can affect your life for years, and working with a lawyer might be the ticket to a second chance that you need. Need a free consultation with an Orange County Criminal Defense Attorney? Criminal defense lawyers play an important role in a criminal defense case. Choosing the right one can make a world of difference in the outcome of your criminal case. Consider several potential attorneys, ask for reviews or recommendations, and don’t be afraid to ask questions. The best lawyer for you may not be the best lawyer for everyone else. Like every legal case, every lawyer is different. 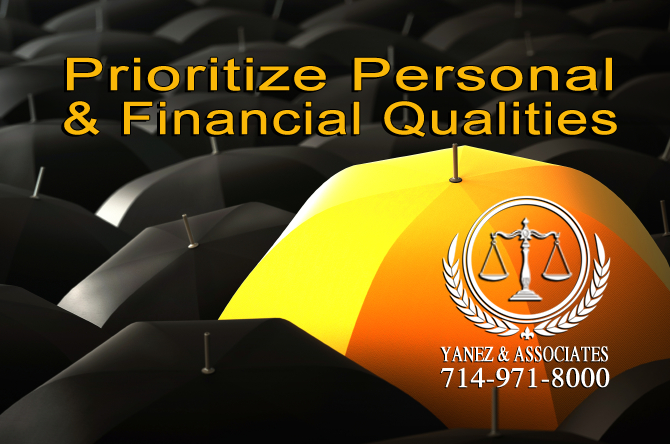 At Yanez & Associates, we offer free initial consultations. Schedule an appointment today to discuss your case, ask questions, and get to know us. 2 What Kinds of Criminal Defense Lawyers Exist? 7 Why Do I Need a Criminal Defense Attorney? Best Criminal Defense Attorneys in Anaheim, best things to consider when Searching for a Top Criminal Defense Attorney in OC, juvenile defense, Orange County Criminal Defense Attorney, Prioritize Personal and Financial Qualities, Questions to Ask a Potential Criminal Defense Lawyer, Reach Out to Potential Attorneys, top criminal defense attorney, Tustin criminal defense attorney, What Kinds of Criminal Defense Lawyers Exist?, Why Do I Need a Criminal Defense Attorney?